Ep. 6: Andre Watson – All Work is Easy Work | Aimee J. 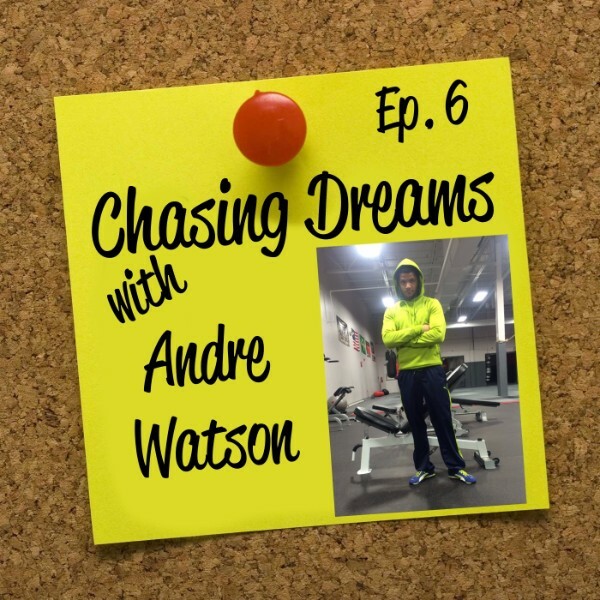 In this episode of Chasing Dreams, Aimee J. is chatting with her own personal trainer, Andre (Dre) Watson. Dre is an amazingly fit guy who loves exercise and training. He’s always been an athlete but didn’t even think about becoming a personal trainer until way after High School. Once he got started he’s never looked back. Find out how Dre pursued his dream of becoming a fitness trainer, how he has established client relationships that have endured many changes in his employment, and how he’s stepping into the scary unknown by starting his own business. This is a fun and insightful conversation you won’t want to miss. When Dre Watson is working with a client he’s not one to allow for any excuses. It doesn’t matter if the client has an injury, is sick, or has some kind of limitation. Dre finds a way to help them work their body without hurting themselves. It’s not that he’s a slave driver, he’s just committed to helping his clients reach their goals. Listen in to this episode to hear how Aimee was helped by Dre’s relentless focus on pushing her toward her goals in spite of a wrist injury. Dre’s a no nonsense guy you’re gonna’ like. All work is easy work: a mindset for success. Dre Watson has learned an incredible mind hack that gets him through some tough obstacles. No matter what the work is that he has to do, he tells himself, “All work is easy work.” What he means is that he will choose to think positively about the task, telling himself that he’s going to be able to get it done easily. That equips him with a mindset to push through it quickly, not giving any credence to difficulty or obstacles. 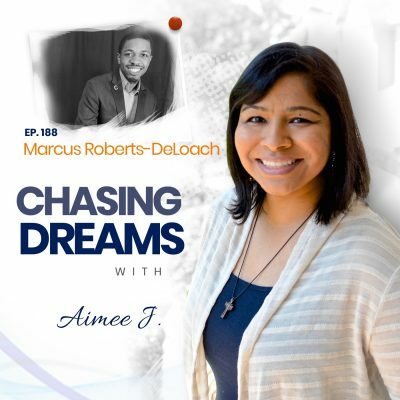 Hear Dre explain it himself on this episode of Chasing Dreams, with Aimee J. Chase your dreams but be realistic. 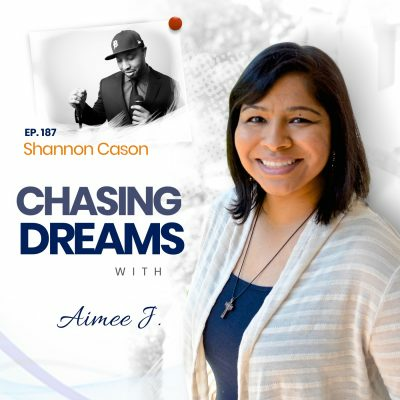 Aime J. and Andre Watson (today’s guest) both believe in chasing dreams. There’s no reason not to go for it. But as important as it is to go for your dreams, you’ve got to make sure you don’t leave your responsibilities behind. Dre is working toward his own full time training business, but he’s not there yet. He continues to work a part time job while he’s getting his business running, setting up his website, and establishing a broader client base. He’s doing that because he’s got a family that he’s committed to taking care of… but he’s still going to pursue his dream. Find out how to do the same in your life by listening to Dre’s story, on this episode. When you have something you love to do, you find ways to make it work. That’s something Dre Watson believes with all his heart. It’s the way he lives his own life and he tries to inspire others to do the same. His personal training business is just getting started and there’s lots of reasons he could have given up. But he hasn’t because it’s the exact thing he wants to do, so he keeps pushing toward it. He figures it out. He finds ways to make it work. As Aimee and Dre chat, you’ll hear the attitudes that make Dre’s “make it work” philosophy work in his life, and maybe you’ll find ways to apply it to your situation, too. [1:19] Welcome and introduction of Andre (Dre) Watson, personal trainer. [2:50] Dre’s story – sports through High School and College to a career as a trainer. [3:56] Why Andre pursued certification as a personal trainer. [5:28] Aimee’s testimonial of how Dre helped her even though she had an injured wrist. [7:08] Dre doesn’t allow for excuses: All work is easy work. [8:28] The power of telling yourself that things are easy. [10:53] How Dre got into personal training through a company called Major Preparation and the journey that pushed him into an entrepreneurial vein. [13:56] The way Dre handled a difficult situation through openness and communication. [16:46] 85% of Dre’s clients stayed with him through various transitions and companies. [17:33] The scary territory of working for himself. [18:44] The importance of being a realist so that you can be responsible. [19:26] Balancing the chasing of your dream with the important responsibilities of life. [20:28] How we can get so focused on the finish line that we forget the journey. [21:50] When you have something you love to do, you find ways to make it work. [24:36] Dre’s crazy new exercises, check them out on Instagram. [31:25] Aimee’s wrap-up of the episode. Aimee and Andre are doing rapid fire alternate answers until someone stutters, stops, or can’t answer. Andre is a physical fitness nut (maybe even a superhero) so Aimee might be in trouble!